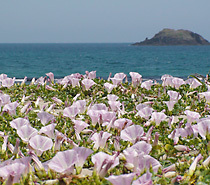 Blessed with varied natural surroundings, the San’in Kaigan area is home to a wide variety of valuable seaside plants and animals. With its geological diversity supporting its biodiversity, the San’in Kaigan accommodates many different species of flora and fauna. Having varied geomorphological and geological features, each area of the San’in Kaigan Geopark has its unique species of plants. 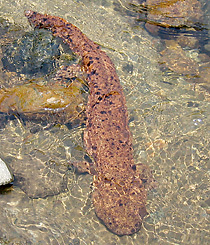 In the rocky coastal region, for example, various marine algae, such as sargasso (Sargassum fulvellum) and wakame seaweed (Undaria pinnatifida), adhere to rocks, forming submarine forests. 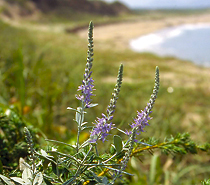 Sand beaches are inhabited by plants adapted to sandy soil and a dry climate, such as sea bells (Calystegia soldanella) and chaste tree (Vitex rotundifolia). Plenty of evergreen broadleaf forests remain in the precincts of old shrines located along the coastal areas. 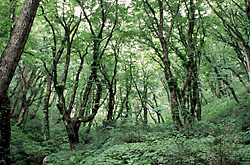 Meanwhile, ancient forests consisting of deciduous broad-leaved trees, such as Japanese beech, spread across the inland mountain areas, such as the area around Mt. Oginosen. Moreover, one can see plants characteristic of each area all through the year. 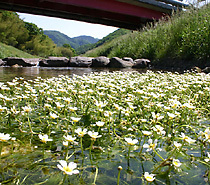 They include Veronica ornata, which grows naturally only in the Japan Sea coastal area and is the symbol flower of Kyotango City, late yellow daylily (Hemerocallis citrina), which grows in the seaside areas of Kasumi, Kami Town, Baikamo (Ranunculus nipponicus) colonies by Takimi River in Shin’onsen Town, whose existence indicates that the natural environment around it is in good condition, colonies of rabbit-ear iris (Iris laevigata) in the Karakawa Wetland, Iwami Town, and wetland vegetation found in Onuma Marsh in the Hachikita Highlands in Kami Town. The San’in Kaigan Geopark is a habitat of many wildlife species, many of which have been designated as endangered natural monuments and are under protection. Among the species designated as endangered on the Red List of Japan’s Environment Ministry are a bird known as golden eagle (Aquila chrysaetos; Government-designated natural monument) living in the highlands around Mt. Oginosen and Mt. Hachibuse, an amphibian called Abe’s salamander (Hynobius abei) inhabiting only some areas in Omiya-cho, Kyotango City, and Hidaka-cho, Toyooka City (both localities are registered as habitat conservation areas of the species), and an insect called four-spot midget (Mortonagrion hirosei) living in the wetlands along the Maruyama River. The Geopark is also home to such government-designated special natural monuments as oriental white storks and the Japanese giant salamander, a “living fossil,” and to the natural monument Japanese Silverlines (Spindasis takanonis) inhabiting the foot of Mt. Kyusho, Tottori City. In the Toyooka Basin, the last remaining habitat of oriental white storks in Japan, community-wide efforts are being made around the Hyogo Park of the Oriental White Stork to restore their habitat and reintroduce them to the wild. 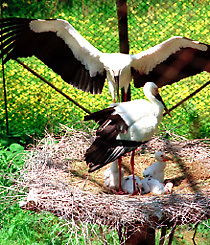 Over 100 oriental white storks are being bred in the Park, which also contains an exhibition cage and observation site designed to enable visitors to observe the storks from up close. Copyright©2008 San'in Kaigan Geopark Promotion Council. All rights reserved. in whole or in part without prior permission of the website's owner.